Lump charcoal or briquettes? Which is best? The two most popular types of charcoal fuel for BBQ and grilling are lump charcoal and charcoal briquettes. In my opinion one isn't better than the other. They both burn and act a little differently so you need to pick the right type for the situation. If you already know what type of charcoal you're going to use then click here for tips on setting up, lighting and controlling charcoal. These are the little guys that look like they've been manufactured. Good reason for that, they are. I've heard quite a few people swear they won't use briquettes because they're toxic (the briquette, not the people) but all my research on this seems to show that they're not. A briquette is charred wood which means it's produced using extremely high heat and very little oxygen so most of the water is driven out leaving almost pure carbon. These are usually made from scraps of wood products, bark, branches and chips but some fillers are also added (non-toxic I understand) to help the briquette keep its shape and make them easier to light (sawdust). Briquettes burn longer than lump charcoal but not as hot so that's something you need to think about if you need a longer bbq or smoking session (6-12 hours). Another thing with briquettes is they produce more ash then their lump cousins so if you've equipment like the Big Green Egg this isn't a good choice - go with lump. Units like these have limited ash collectors and too much ash can end up smothering your fire. I'm going to suggest that you do not use briquettes that are sold as "easy light". The lighter fuel they've infused in the briquette can give off odors that can be picked up by the food. The fumes will burn off after a while but raw meat is most susceptible to absorbing flavors before it forms a crust (called the bark). I like this type and use it most often because I'm also a (Big Green) Egghead. It's very quick to start (electric starter works best in BGE if you've got power) and can get up to very high heat in no time at all. No reason you shouldn't see 600-700F in 20 minutes or so. Like the briquette it's charred wood made using the same process of high heat/low oxygen. It's also made from every type of scrap wood and logs you can imagine (you can find some strange things in a bag of lump charcoal...). Unlike the briquette it isn't formed into consistent shapes and has no fillers - it's made, cooled, bagged and sold. Because the lump comes in all shapes and sizes it is more difficult to get an even consistent heat across the range of the bbq and grilling surface. Not a big deal if using an indirect cooking method (Green Egg has the plate-setter for this). It can actually work to your advantage when direct cooking once you find the hot-medium-cool spots on the grill! Lump burns hotter but not as long as briquette so kind of a pain if doing long burns as you'll need to replenish more often. And as mentioned, less ash residue. Good news is it starts quickly so if you have to refill it takes off quicker too. If you can find these then try them. Made from pure hardwoods they burn much hotter than standard briquettes but cost a bit more. 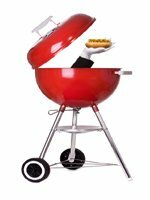 These are very popular with the grill pro's.